S I D E W A L K / C A T W A L K: This dude is cool looking. Yup. This dude is cool looking. Yup. 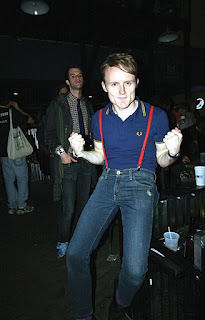 Granted he's an uber dork and the Fred Perry/suspenders combo is a little contrived. Regardless, I'm digging this look and if I were a dude I'd dress just like him.